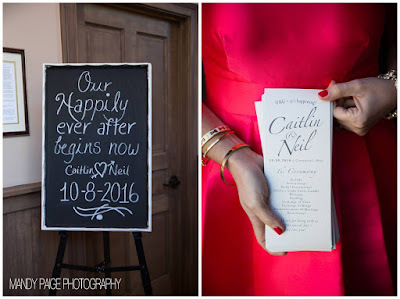 Belle On Trend: Bow Back Kate Spade Dress + Neil and Caitlin's Wedding! Bow Back Kate Spade Dress + Neil and Caitlin's Wedding! I had admired this dress for years, since I first laid eyes on it on the Kate Spade website. The original price was $450, and GOD knows I wouldn't pay $450 for anything other than a car part. LOL (Which, by the way, was the exact price of this Monday morning's alternator disaster. I went to leave for work, and my car made such an awful sound that I thought it was a radio commercial for a haunted house. Then the battery light came on. Fast forward a smidge, and I take Mike's car to work, he works from home and brings it to the shop down the street. The mechanic said he was genuinely shocked that it didn't die on us on the highway when we were heading to or from Caitlin and Neil's wedding. We DEFINITELY have to be grateful for that and for our guardian angel. Need to keep things in perspective!). 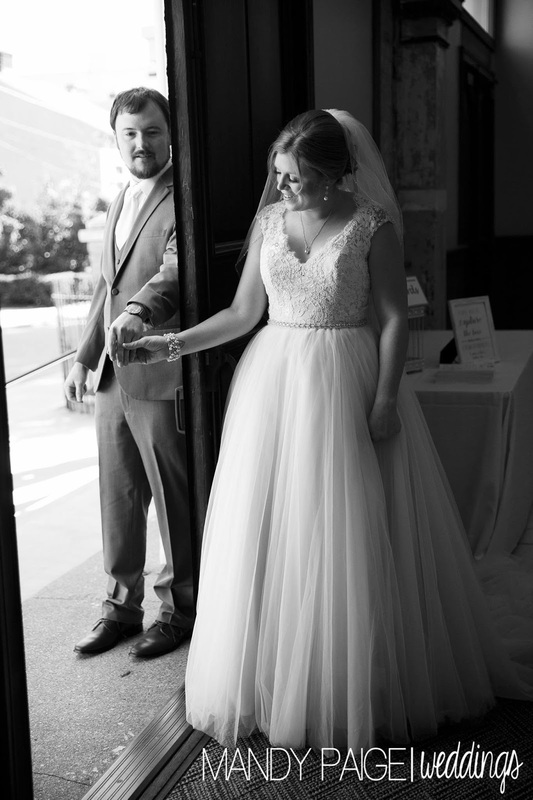 We were walking around in downtown Cincinnati before the wedding, snapping some pics along the way, and so many girls stopped me to tell me they loved my dress. But they had only seen the front! I believe my words to one lady were, "GIRL, you gotta see the back!" Mike laughed pretty hard at that. There is no price to put on feeling your best in a girly dress you adore, but this one came at a $116 price tag at the Kate Spade Outlet in Aurora, Illinois. I have seen this dress in multiple colors every time I've been at the outlet. I can't explain to you how many times I have tried this very dress on, and then talked myself out of it. In fact, I have almost rented it several times, too, on Rent the Runway! But now I own it! My seamstress is amazing-- she took it in (I got a size 6 for reference, but I needed it taken in. A five would have been perfect, had it existed haha!) and sewed in cups. Please let me know if you ever need a seamstress in the Chicago suburbs. Charice is incredible! She works out of her home in Bartlett. 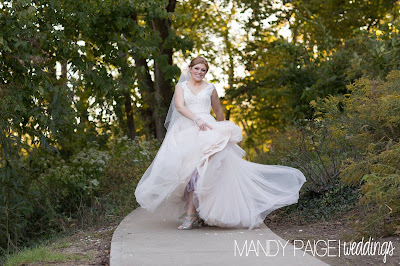 Anna made fun of me and said I was doing "wedding shots" of my deets. Haha. Touche. I just felt so fancy all night! ^^ seconds before disaster struck and the winds blew all that water onto me and into my hair! hahaha! Major fashionblogger fail. Good news: the dress was fine and dried perfectly without a trace of the fountain attack! More deets! Bows on bows on bows. Left bow bracelets: top, middle, bottom-- all Kate Spade. Right side bracelet: my wedding bracelet from Ann Taylor, old, but similar here. My wedding shoes! I wear these so often! They were on clearance for $90 from J. Crew in the summer of 2014. Old J. Crew, similar here. That bow. It just makes me smile! I loved the thickness of this dress. It was structured and did not wrinkle all night, despite sitting through dinner and the ceremony. I didn't have to get any length taken off. If you're a taller gal, you might just need the hem undone. SIDE NOTE: it has pockets!!!!!!!!!! I can't even begin to give this dress's comfort justice. Just believe me when I say I could eat as much cake and delish food as I wanted to with no discomfort. Ha! Finn's first experience in shoes. How cute is this seersucker suit?! Waiting outside the Monastery with mom. That was honestly the most gorgeous wedding venue I had ever seen! My wedding earrings from our wedding! Old Ann Taylor, similar here. The ceiling of the venue. 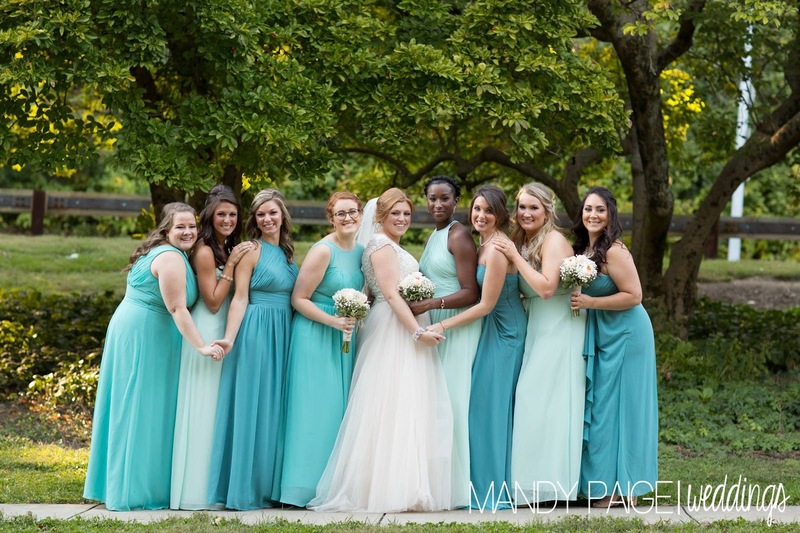 Beautiful shades of teal! I cannot handle how cute Finn is! In between the ceremony and reception, overlooking the city. Neil and Caitlin's ADORABLE (and delish) wedding cake! Neil is a big time car guy, and he races, too! Their cake topper was PERFECTLY them! My sister couldn't look prettier. How did she just birth a kid?! Her dress is from Rent the Runway. I love you, forever wedding date! Now to the important pictures: my cousin Neil and his gorgeous wife, Caitlin! My new cuzzie! And her stunning bridesmaids!). I've known Neil since I was 10 days old (I'm 10 days older, haha!). Here's a great pic of us as baes. Also, Mike says I still make that face (I'm in acid wash in the front, Anna is in the middle!). Caitlin's bridesmaids are some of the sweetest women I've met! They just were all so welcoming to me at the shower and wedding. I love them! It just goes to show what a wonderful person Caitlin is because her friends are all so kind. ^^^ does that dress back drop look familiar? hehehe! 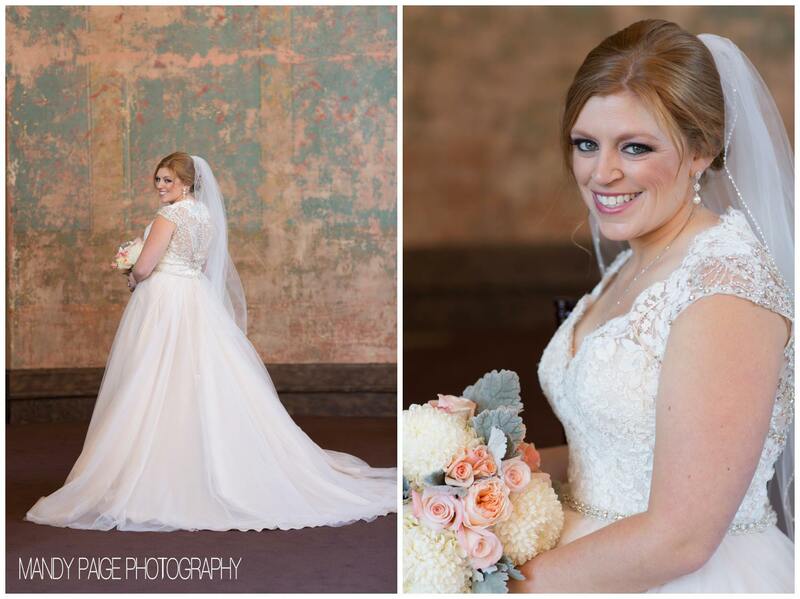 Mandy Paige was their photographer, and she did an unbelievable job! I think this is my all-time fave pic of the bride. Showing off her fabulous Michael Kors pumps and breathtaking gown. 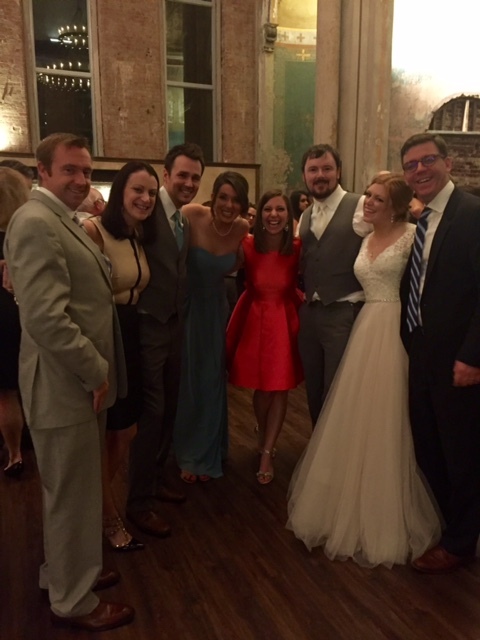 Shawn and Anna, Josh and Kara, myself, Neil, Caitlin and Mike! Dancing with dad during the fathers-daughters dance! Tell me about the last fab wedding you went to! Lovely pictures, looks like fun! Happy Halloween from Belle On Trend!